Today marked two full months that I've been a commuter in Toronto. Every morning at around 8:00, I walk from my apartment to Dupont Station, which takes about ten minutes. I then travel south six stops to Osgoode Station, walk for another five minutes and arrive at my desk at approximately 8:30. Dupont Station is located near a college so I'm always one of only few people going into the station as students spill out of it. 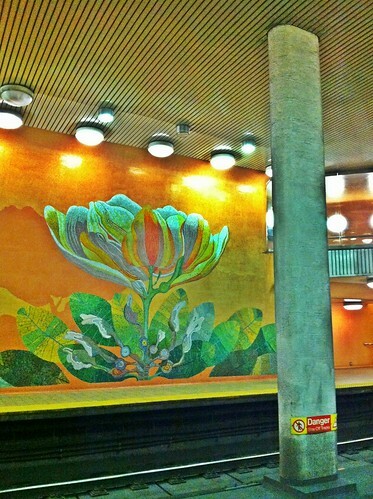 From the southbound platform, I see this large floral mosaic. Dupont Station opened the year I was born (1978) and there's no doubt to be had about the decade of construction when you see that the orange tile. 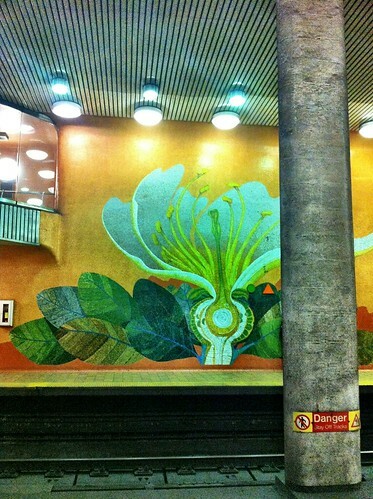 Still, this is one of the most cavernous of the Toronto stations, so not a bad place to wait for the subway. I am able to get a seat almost everyday. I don't think the same could be said if I was boarding on the opposite side of the U-shaped subway line. My brother boards at Eglinton and tells me he has never gotten a seat in years of commuting (even when he had his leg in a cast). My side of the subway line seems to reach fewer riders from the suburbs. At St. George station, the train always fills up with commuters changing from the east-west line. There is a certain bending of time that happens when traveling by TTC. If I leave my apartment at 7:55am, I will arrive at the office only five minutes earlier than if I had left at 8:10. When the trains are more frequent, each train moves very slowly through the tunnels, as slow as walking pace and often stopping completely. The later I board the train, the quicker the trip. Today was the first time in two months that I experienced a major delay. We sat in darkened trains for 10 to 15 minutes at Spadina Station. No big deal - I just arrived at 'normal' working time instead of the earlier start time I aim for. After I finish up at work or at the gym across from work, I walk back to Osgoode and return northwards to Dupont. I'm more likely to have to stand for the journey since there are so many of us leaving the central business district at once. 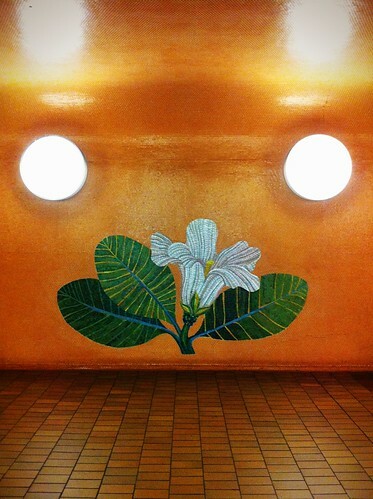 When I reach Dupont, I see the floral mural facing the northbound platform. Although I've lived in Toronto for 10 years or so, I always had my accommodations within walking distance of where I needed to go, be it class or work. I do prefer it that way, to be honest. Lately, I often think of my first experience as a commuter, in Japan. I used to ride the Hankyu Imazu line (阪急今津線) to and from my job in Takarazuka. The transit pass, paid for by my employer, was valid only for the route between my home and work stations. The departures were so precise, I knew what moment to leave my apartment in order to reach the platform on time. My journey was on two train lines: the three minute trip from Imazu to Nishinomia-kitaguchi, then a seven minute transfer (enough time to grab snacks for the day at the 7-11 or at the Beard Papa stall inside Nishi-kita), then another 30 minutes onward to Takarazuka Station. As I was traveling at off-peak hours, I'd always get a seat on a spotless green velvet banquette. The entire route was overland so the dissonance of level crossing signals are preserved in my mind forever. Really, is it possible not to get nostalgic about train travel?